180 Medical Blog / Catheter Resources / Will My Insurance Cover Catheters? Will My Insurance Cover Catheters? Without using your health insurance, buying disposable medical supplies like intermittent catheters can take a toll on your wallet. According to recent data from the Centers for Medicare and Medicaid Services, the average American spends over $9,500 a year on healthcare. Has your doctor prescribed intermittent catheterization to help treat your urinary incontinence, bladder retention, or another urinary condition? It’s normal to worry about how to afford catheters. However, your health insurance could help! Here are the answers to your most frequently asked questions about insurance coverage for catheter supplies. How Much Do Catheters Cost? If you have insurance, it all depends on your particular plan’s catheter coverage. Many insurance plans pay for sterile-use catheters at absolutely no out-of-pocket cost to you. Some plans have a deductible for you to reach before they will begin paying a percentage toward your incontinence supplies. Find out more about how certain insurance plans cover catheters below. Are Catheters Covered By Insurance? The answer in most cases is yes! Whether you have Medicare, Medicaid, or private insurance like Blue Cross Blue Shield or Tricare, you have a good chance for insurance-covered catheters. However, if your insurance does not cover catheters, you still have options for buying low-cost catheters. We recommend checking out Personally Delivered for great prices for purchasing intermittent catheters, incontinence supplies, diapers, and more. Does Medicare Pay for Catheters? Yes! 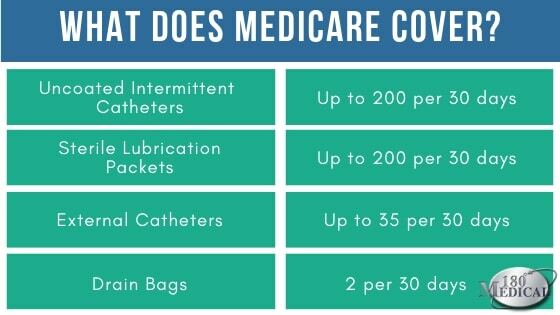 Medicare Part B currently covers up 200 sterile-use intermittent catheters and individual packets of sterile lubrication per month, depending upon your individual needs and frequency. Your catheter supplier must dispense the prescription as written by your doctor. So, for example, if your doctor’s prescription recommends self-cathing twice a day, you’re eligible to receive up to 60 catheters every 30 days. Medicare pays 80% of your intermittent catheter supply cost after the annual deductible is met. If you have Medicare and a secondary insurance plan, the supplemental insurance will most likely cover the remaining 20% of the supply cost. Some people have a private HMO or PPO Medicare replacement plan. Your out-of-pocket costs may be lower with these plans than with standard Medicare. You can find out more about your Medicare plan choices here. Ultimately, your Medicare policy will require a prescription as well as supporting documentation from your doctor’s office. In certain circumstances, Medicare will also cover coudé catheters if you are unable to pass straight catheters. Your doctor will have to make notes justifying the need for a curved tip catheter over a straight tip catheter. Medicare will also sometimes cover advanced catheters like closed system catheters in special circumstances. To find out more details, read our blog about Medicare’s advanced catheter requirements. Contact 180 Medical to find out more about what incontinence supplies are covered and can be combined with your intermittent catheter order. Does Medicaid Pay for Catheters? 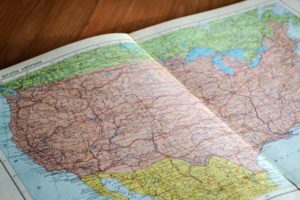 Medicaid coverage for catheters varies from state to state. In many situations, you may be able to get your catheters at low or no cost to you after they cover their portion. 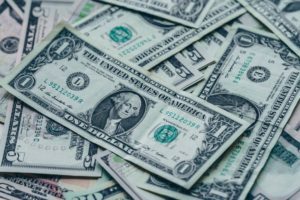 Other states may have what is known as a spend-down requirement before they will pay for your supplies, and some will only cover a certain amount per month. 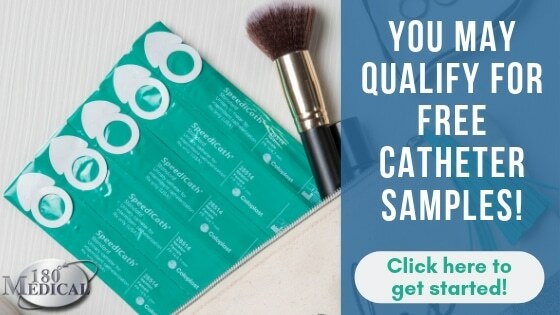 You may be eligible to receive closed system catheter kits or hydrophilics, or you may only be able to get uncoated straight catheters. The best way to know for sure what your state Medicaid’s program will cover is to give 180 Medical a call. We’ll work quickly to verify your Medicaid plan and let you know what your coverage will allow you to get. Does Private Insurance Pay for Catheters? Private insurance plans differ depending on your plan and the company. It’s difficult to accurately quote your out-of-pocket cost without verifying your insurance. This is because each plan has varying annual deductibles and out-of-pocket limits. Also, most private insurance companies have different percentages paid toward your disposable incontinence supplies after your deductible has been met. The good news is that many private insurance plans cover advanced catheter products. For example, you could receive closed system catheters, ready-to-use travel catheters, or hydrophilic catheters. It mainly depends on the company and your specific plan’s coverage. We’ll be more than happy to verify your insurance for you and discuss your plan in depth. We want you to fully understand your insurance’s catheter coverage and available product options. Do I Have to File My Own Health Insurance Claim? No, not when you get your supplies at 180 Medical. We gladly handle filing your claim for you with your insurance company. This is a completely free part of our top-tier customer service. Plus, you won’t ever have to worry about paying for your catheter supplies upfront with 180 Medical and then having to wait weeks for your order. As an ACHC-accredited and Medicare-accredited provider, you can trust that 180 Medical will always follow guidelines and do what’s right to ensure total compliance. How Many Catheters Will My Insurance Cover? In order to buy catheters, whether with or without insurance, you must have a prescription from a healthcare professional. All insurance plans will require a prescription at a minimum, but many plans also require additional documentation. For example, Medicare requires a prescription and additional documentation in your doctor’s notes to show how many catheters you will need within a 30 day period. Medicare will cover up to 200 single-use catheters per month. This is enough to self-cath sterilely between 6 and 7 times a day within a 30 day period. The amount you can receive up to this limit will entirely depend on your prescription. However, each insurance plan is different, so the limits on how many sterile-use catheters they allow may vary. Concerned about having to do the footwork to gather a prescription or documentation for your medical supply provider? 180 Medical takes care of everything for you, including communicating with your doctor’s office to obtain any information your insurance requires. Where Can I Get Insurance-Covered Catheters? 180 Medical is one of the largest and highly-rated catheter suppliers in the nation. We’re contracted with over 1,200 insurance plans, including Medicare, state Medicaids, and a growing number of private insurance plans. Our specialists are glad to help you find an insurance-covered catheter to fit your needs. First, we’ll verify your insurance policy. Next, we’ll call you back and inform you fully about how your catheter supplies will be covered. Additionally, before we ship your first order, we make sure to let you know about any potential out-of-pocket costs based on your insurance coverage. When you call 180 Medical, you won’t have to deal with annoying automated phone menus. 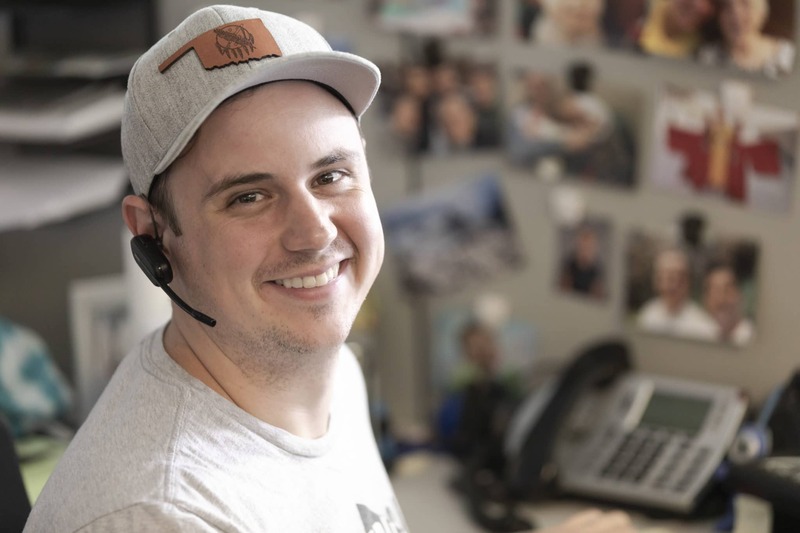 During business hours, a live person answers your call. You’ll get to speak with a specialist who really cares about you, your time, and your health. Our staff goes above and beyond to deliver you 100% satisfaction with a wide range of the top brands and types of quality catheter supplies. Experience the service that our customers review so highly. Contact us at 1 (877) 688-2729 or on Live Chat on our website during business hours. Curious what documentation Medicare requires in order to cover your urinary catheters? Learn more details with our latest blog. What do you need to know about catheters? Get the top 5 answers here.